Howard Massey, author of The Great British Recording Studios, sat down for an interview with on the Producer Crosstalk segment of Music Connection to discuss his career from a musician to now an author. The Great British Recording Studios tells the story of the iconic British facilities where many of the most important recordings of all time were made. Check out the excerpt below. Engineer, music journalist and newly minted novelist Howard Massey came to the business as many do: as a musician. After a move to London and an inked publishing deal, he logged hours at Pathway Studios. When the engineer there told him he was leaving, he asked Massey to fill the vacancy. As his repertoire broadened, he found that he was something of an expert on the Yamaha DX7 synthesizer. So good, in fact, that a friend suggested he write a book on it. He’s since scribed Behind the Glass and co-authored Geoff Emerick’s 2006 acclaimed Here, There, and Everywhere. Recently he has branched into fiction. Howard Massey’s career has been shaped by a series of “left turns,” as he calls them. “I started out wanting to be a rock & roll star,” the writer explains. “I discovered that I had good ears. When I returned to New York, I was offered a job at Electric Lady Studios and when the [Yamaha] DX7 came out, I got one of the early ones. I found that no one really knew how to use it, including the people at Yamaha, surprisingly. So I locked myself in a room and learned to program it. A friend said I should teach other people. Later, someone else suggested I write a book.” In 1986, The Complete DX7 was published and his literary career thereby drew its first breaths. With such a level of studio acquaintance––37 featured in Behind the Glass––Massey has thoughts on what signifies a space with staying power. “If people are flocking to book a studio, there’s something they’re doing right,” he observes. “Of course these days any studio that’s still in business, by definition, is successful because everything’s changed dramatically. Clients demanded more and record companies insisted on lower hourly rates. Studios got caught in the cash crunch. Of the 36 discussed in my book The Great British Recording Studios, only three are still in business. Howard Massey speaks with AudioFanzine! Author of The Great British Recording Studios, Howard Massey, was interviewed by AudioFanzine. AudioFanzine is an online magazine that caters to musicians as well as sound engineers, home-studio recording enthusiasts, and more. Read an excerpt of the interview below and see it all at AudioFanzine! In the early 1960s, at the beginning of the British Invasion, the studio scene in England was thriving, but the British studios used different gear and got a very different sound than their U.S. counterparts. In recent times, most of the major British recording studios have closed, and for a time, it looked like much of their history was in danger of disappearing, too. Massey agreed, and spent the next five years researching the book. The result was The Great British Recording Studios (2015, Hal Leonard Books), a fascinating read for any fan of recording. It looks at the major British studios during those decades, including who recorded in them, what gear they used, who the engineers were, and more. Audiofanzine had a chance to talk to Massey and delve into the world of British recording in the golden years. The book goes into great detail about the studios, including their engineers and gear collections. How did you get all that information? Well, it was an enormous research project. I kind of think of it now as the world’s longest term paper. I was given access to the APRS archives, all the major studios were members and as part of membership they had to submit their equipment listings. So I had access to that, and also, there was an APRS directory that was published every year in which most studios took ads and listed their equipment. So I was able to track the changes through the years. And then, tons of online sources, and there were annual Billboard listings in England of studios. So basically, it was a lot of putting pieces together. But the material was sourced from the studios themselves. It was not third-party, or estimates. It was all actual hard facts and figures I was able to find sources for. Did you interview lots of people, as well? I interviewed over 300 people. Did you spend a lot of time over there doing this? I made five trips to England over the course of the five years. Because of the Beatles, we’ve heard a lot about EMI Studios (now Abbey Road Studios), but Olympic and Trident were the other two really big ones back then, right? Yes, I would say. Along with Decca. Decca was probably a little more well known for classical recordings, but the Decca complex was actually bigger than the EMI complex. It was actually larger. And Decca is where they invented the Decca Tree stereo-miking technique? Exactly. That was one of the key technical innovations. Of course, EMI was responsible for the Blumlein pair, which is kind of the counterpart. But in terms of pop, EMI, Trident and Olympic were the big three. The Who did a lot of recording at IBC, that was another big studio. And there were a few of them, the prog-rock bands like Yes and ELP tended to work at Advision, another key facility. And then there was a very, very large film-scoring facility called Delane Lea CTS, where almost all the James Bond films were scored, the blockbuster James Bond films out of the ’60s were recorded there. Howard Massey, author of The Great British Recording Studios, was featured on the 254th episode of Pensado’s Place! In this episode Howard Massey speaks about Abbey Road, EMI, and many other groundbreaking music operations of the early and mid 20th century and emphasizes the importance of historical knowledge in addressing the modern music environment. Watch the video below to learn more! From the time that Thomas Alva Edison invented the phonograph in the 1870s, music has become an integral part of everyday life. Nine decades later, the “British Invasion” spearheaded what was inarguably one of the most important and creative periods in the development of recorded music. In The Great British Recording Studios (November 2015, Hal Leonard Books, $34.99), Howard Massey tells the story of the iconic British facilities where many of the most important recordings of all time were made. The first comprehensive account of British recording studios ever published, it is endorsed by and was written with the cooperation of the British APRS (Association of Professional Recording Services, headed by Sir George Martin) to document the history of the major British studios of the 1960s and 1970s and to help preserve their legacy. The Great British Recording Studios surveys the era’s most significant British studios, including Abbey Road, Olympic, and Trident, with complete descriptions of each studio’s physical facilities and layout, along with listings of equipment and key personnel, as well as details about its best-known technical innovations and a discography of the major recordings done there. Seamlessly interweaving narrative text with behind-the-scenes anecdotes from dozens of internationally renowned record producers and a wealth of photographs – many never published before – Massey brings to life the most famous British studios and the people who created magic there. His “Stories from the Studio” take readers behind the scenes of the making of some of the world’s best-loved records, including The Beatles’ Sgt. Pepper’s Lonely Hearts Club Band, Pink Floyd’s Dark Side of the Moon, The Kinks’ “You Really Got Me,” and the Rolling Stones’ Beggars Banquet. George Martin, the music producer of the Beatles and one of the most influential producers in music history, has passed away. He was often referred to as ‘the fifth Beatle’ for having discovered the Beatles and producing their records when no one else would. In memory of his passing, below is a foreword that he wrote for the book The Great British Recording Studios. AFTER THE SECOND WORLD WAR, England was a battered nation with the hopes of its people at a low ebb. True, no enemy had landed on our shores, but the standard of living and morale were low. Everyone was weary, yearning for a sign of relief from the misery that war had brought. The heavy bombing of major cities like London and Coventry had done more damage to the spirit of the people than any material destruction of their homes and property. But then, with the coming of the ’50s, music began to lighten the scene. Records gave the young hope, and teenagers bought and swopped records from the USA as well as the homegrown ones. In a pretelevision age, sound was king. And the United States seemed to be the best place in the world for rock ’n’ roll music. So Britain woke up. Suddenly, good sounds were being made in good studios. Not just from the big boys like EMI and Decca, but also in little independent studios that gave free rein to their clients. We demanded and received better recording facilities. Tables were turned, and our records became the envy of other European nations. And happily, I was there. ‘The Great British Recording Studio’ is featured on Sound on Sound! In the March issue of Sound on Sound, a leading magazine on music recording technology, Hugh Robjohns reviews Howard Massey’s authoritative The Great British Recording Studios. Read a snippet of the review below, and let us know your thoughts in the comment section! Anyone with a keen interest in the hey-day of the British music recording industry, from, say, the late 1950s through to the mid 1970s will probably already be familiar with some of Howard Massey’s books, such as Behind The Glass volumes I and II, and Here, There, And Everywhere (a Geoff Emerick biography). Those worthy tomes focus on some of the people involved, but his latest offering, The Great British Recording Studios (Hal Leonard, ISBN 978-1458421975), focuses mainly on the places — it’s a fascinating and commendably detailed book, which provides a wonderful overview of the significant recording studios in London in the ’60s and ’70s, as well as a few noteworthy facilities elsewhere in the UK. Most of these facilities are now long-gone, of course, but Massey has tracked down (with the cooperation of the APRS) many of the managers, maintenance engineers, and recording engineers who built and worked in them, to get their first-hand histories, recollections, stories and trivia. The introductory chapter discusses the nature of the ‘British sound’ and some of the possible reasons for the distinct character attributed to recordings made in the UK’s leading studios, in comparison with those of the USA. Not surprisingly, the first major studio to be examined in the book is EMI’s Abbey Road, with the text, illustrations and period photographs covering the basic layout and dimensions of the three studios, their acoustic environments and treatments, and the available facilities including echo chambers, mixing consoles, monitors, tape machines, microphones, outboard equipment, and so on. There are also sections on the key personnel involved, as well as a brief discography of some of the major recordings created at the studios, and any significant industry innovations — for this was a time of countless ground-breaking developments in the recording industry. For example, did you know the DI-box concept was invented at Abbey Road? Your chance to win The Great British Recording Studios! 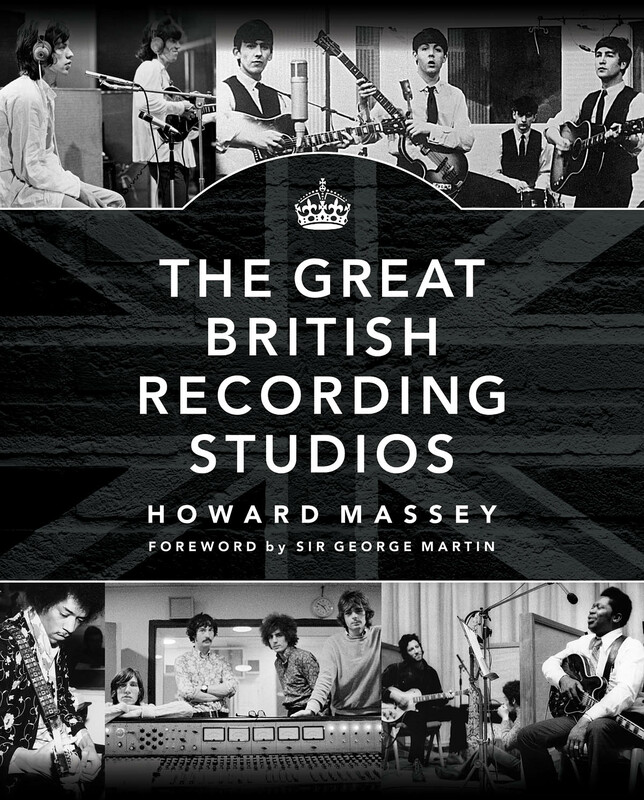 Audio Technology Magazine is offering you a chance to win Howard Massey’s book, The Great British Recording Studios. It’s quick and easy, just sign up to AudioTechnology E-News and you could be the lucky winner! Click on the link below to sign up and enter promo code ‘BRITSTUDIO’ to enter the draw. Best of luck! In The Great British Recording Studios, Howard Massey tells the story of the iconic British facilities where many of the most important recordings of all time were made. The first comprehensive account of British recording studios ever published, it is endorsed by and was written with the cooperation of the British APRS (Association of Professional Recording Services, headed by Sir George Martin) to document the history of the major British studios of the 1960s and 1970s and to help preserve their legacy. 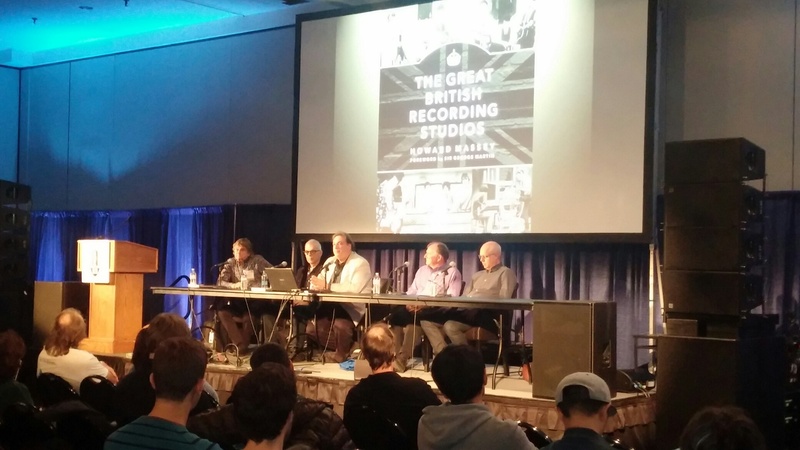 Last week, Hal Leonard introduced Howard Massey’s book, The Great British Recording Studios, at the 139th International Audio Engineering Society (AES) Convention in New York. Author Howard Massey led a panel on his book along with other recording legends such as Bill Foster, Tony Visconti, John Smith, and Jules Standen.